This blog post has been over 18 months in the making! 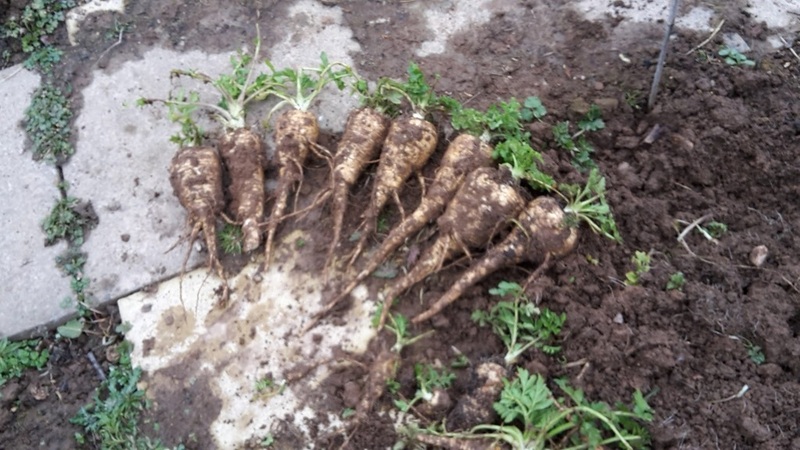 Parsnips are a biannual plant so to they only flower and set seed in their second year of growing. 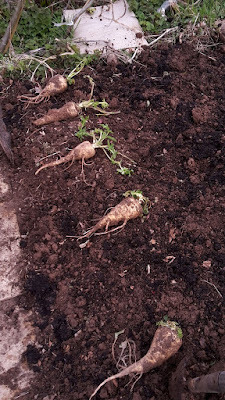 Last year I grew a good batch of parsnips which we ate all winter, but I saved the best ones to grow on for seed. In march I sorted through them and planted them in a new bed. Parsnips selected. Not the most perfect but they're all a good size. They grew all summer, reaching a height of over 6ft with no care from me whats so ever! The green flowers at the back are the parsnip ones. I once the flowers had set and the seeds formed the plants started to dry off. I picked a sunny day and harvested all the flower heads, with stalks still attached, and hung them up in the shed to dry out fully. 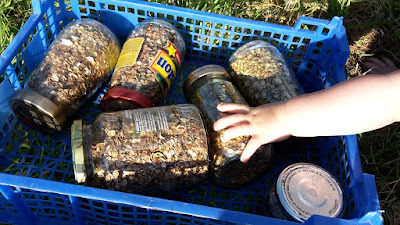 Then a month later (this Friday just gone) it was a a lovely sunny afternoon so I decided it was time to collect the seed from them. 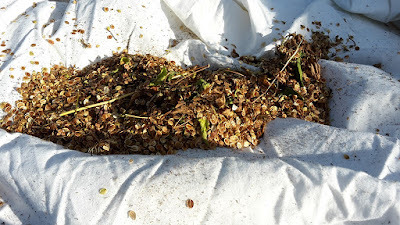 To get the seed was simple, I laid a dust sheet on the ground (an old bed sheet actually) and then we "threshed" them in batches. To thresh them we just used a 5ft length of bamboo cane and hit them, periodically we'd stop, move the seed heads, pick out all the big bits then scoop the seeds into a jar before starting again. The girls loved this job and thought it was great to collect the seed up as well. The girls threshing the seed heads. 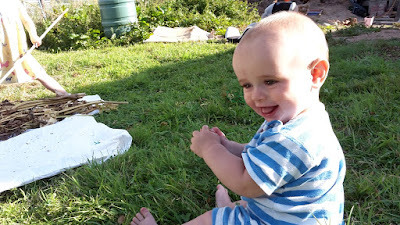 The boy thought this was great fun as well! A bit of the seed fresh off the dried plants. A big batch of seed saved up and a chunky arm trying to steal them! 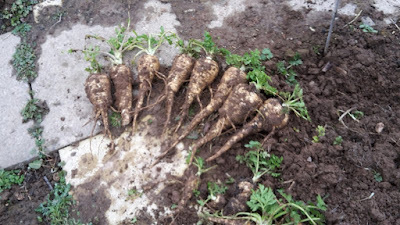 Growing these parsnips for seed has been great fun and I certainly learnt a lot doing it. The main thing I learnt is how much space it takes to grow something for seed. These plants took up a huge amount of space, not something that you could do in an average UK garden that's for sure! I think growing things for seed would be best done in groups of like minded people, each growing a different variety of carrot for example. 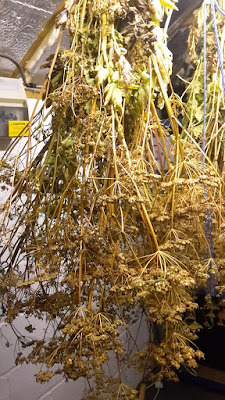 To try to do it all yourself each year (or every other depending on how long the seed lasts) would be a massive undertaking, not just with the growing but the planning as well (cross pollination of certain plants), something that needs careful consideration from anyone planning for full self sufficiency or a grid down situation. I now have a massive amount of parsnip seed that I'm going to use myself, give away to friends, take to the seed swap next year and give away on this blog. I have five huge jars full of seed, far more than I could ever use. Later in the year I'll be posting on here how you can get some of my saved seed, I'm currently thinking just a self addressed envelope sent to me and if anyone wants to send some saved seeds back that'll be great (a little like I did with my blogging seed swap last year), hopefully I might have a few more seeds to swap with people by then as well. Who else has grown biannual plants for seed? Does anyone want any free parsnip seed? I should save more flower and bean seed or maybe we should just swap our seeds! Its wonderful to show the children the circle of life. I take my grandchildren down the garden and show them. How everything starts its life. It's a great thing to do, although it can be embarrassing when people ask what we're doing with the animals and the girls just look at them with a puzzeled look and say " kill them and eat them!". Makes me laugh everytime! Kev, I just can't grow parsnip for some reason...a mystery...but perhaps it's not me but our climate;P Well done on your seed saving. You'll never be without food when you have seeds to keep it going:) It's wonderful that you take time to teach your own children too - that's another of your great skill- definitely!! Anyone with a hotter summer seems to struggle from what I've read, and you're summers are certainly hotter than ours. I still need to up my seed saving efforts but each year I do a little more. The kids love the garden so it's no effort to get them interested! Our problem up here in northern Minnesota is that our season is so short, our crops rarely get the time to go to seed and then dry enough. Have had a little luck pulling the plants and hanging them in the garage or a shed IF they are far enough along when a killing frost strikes. Can't beat a bit of child labour. no better way to spend a sunny hour in the afternoon! Theres a few more plants that I'm waiting to dry off so I think they'll get pulled and hung up now. Don;t buy any seed then - have some of mine instead! They don't take up much room just for the roots, although they are in teh ground a long time. I lived in Oxford long ago and a neighbor shared some parsnip sherry with me. If you ever pursue that particular line of parsnip-related consumption I'll be interested to read about it. I had never heard of such a thing and thought it was delicious! I don't suppose you have a recipe for it? I have dozens of old wine making books but it's been a while since I've made any! The sherry sounds nice. Great for your children to learn where food comes from, a far better education than any school would give them, they look as though they loved helping as well. They've enjoyed the whole process, but bashing the seeds out was their favourite bit! What made you choose parsnips? And did you have to worry about them crossing with carrots or wild members of the family (like our queen anne's lace we have here?) I would love to try some seeds. It would be fun to tell the story of how I came to grow them when we cooked them! I chose them purely because I had a glut left over from winter to choose some good ones from. As for cross pollination it is my understanding that they ca only cross with other parsnips or wild parsnips (not all other umbelliferae). I only grew one variety for seed and I have seen no wild parsnips in my hedges (more common in the self east of England apparently). My reference for this is the book Back Garden Seed Saving by Sue Stickland - although if you have any other information about cross pollination I'd like to read it, I'm still relatively new to the more advance seed saving techniques. You're more than welcome to some seeds, I'll put detail on the blog later int eh year. Certainly Dawn, I was going to do you a little package of all the seeds I've managed to save this year. I have a great coriander going to seed at the moment but I'm not sure it's going to make it now as the weather turns! I would love some of your seeds! I have been thinking for a long time now that we must do this on our allotments and you have inspired me. My Florence fennel bolted this year and I am leaving this to go to seed. Don't know if you like the stuff, but I would love to seed swap. It's also lovely to see how involved your kiddies are. Sounds good, although be careful if you're using seed from a plant that bolted earlier than it should have, that means you're selecting it for that trait. I love fennel just for it's big massive flowers growing bout 5ft high, I never plant it now, it's just self seeded all round the garden. They get roped into everything. Today they were cleaning shallots like it was a privilege!